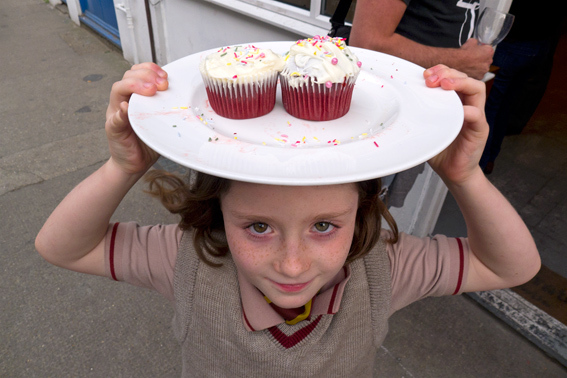 On Friday afternoon of the Olimax PortrATE show, Grace made a return visit with some red velvet cupcakes. She’d been to the opening on Tuesday and wanted to have her portrait taken in the manner of Oli’s portraits of people with food. I was impressed by her cake making skills and was happy to oblige. 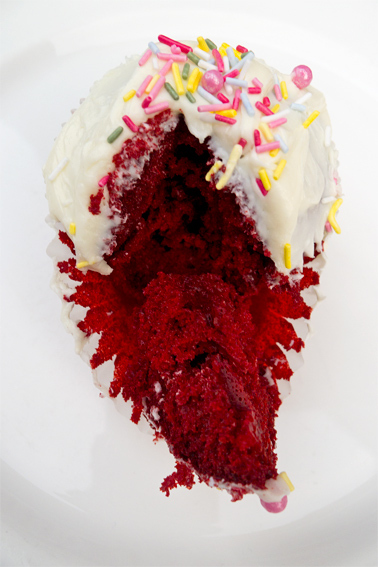 The name red velvet cake comes from the intense red colour of the sponge, produced by using beetroot or red food colouring as an ingredient. This one was topped with a buttery cream, hundreds and thousands, plus a few sugar balls. Grace’s cakes were excellent! This entry was posted in Food and tagged beetroot, cake, cream, cupcake, food, hundreds and thousands, Olimax, PortrATE, red velvet, sugar balls, The Outside World. Bookmark the permalink. Great to see some sweet things on your blog and a lovely photo of Grace whoever she may be. Oh bless her and her gorgeous cakes!